New York Gov. 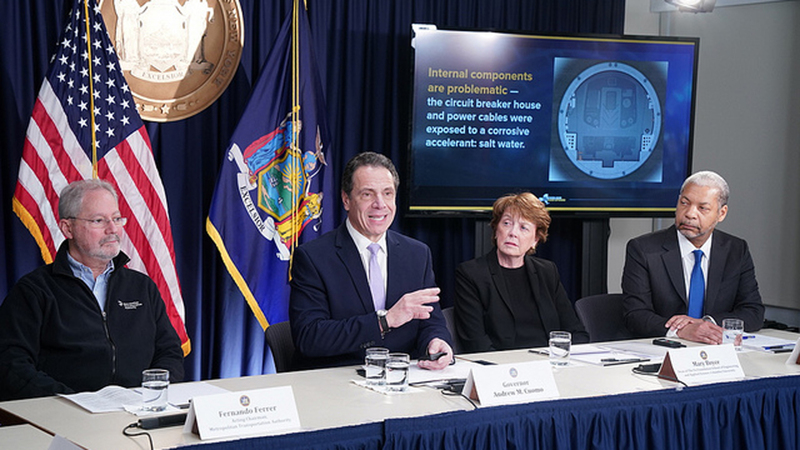 Andrew Cuomo speaks at a press conference announcing a new plan to repair NYCT’s L train Canarsie Tunnels with Acting MTA Chairman Fernando Ferrer, left, Columbia University Engineering Dean Mary Boyce, center right, and Cornell University Engineering Dean Lance Collins. Photo courtsy 2ns Ave. Sagas. New York Gov. Andrew Cuomo shocked the transit world and almost everybody else by announcing that the planned 15-month shutdown of all service on New York City’s “L” train along 14th Street in Manhattan and into Brooklyn will not happen after all. The news stunned even the most jaded New Yorkers and started a local political fight that is still raging. Cuomo arrived at his decision by performing an act that millions of us perform at some time in our lives, and the results could have a revolutionary effect on planning and financing transit projects around the country for decades to come. Everybody in parts of Manhattan and Brooklyn was dreading it. 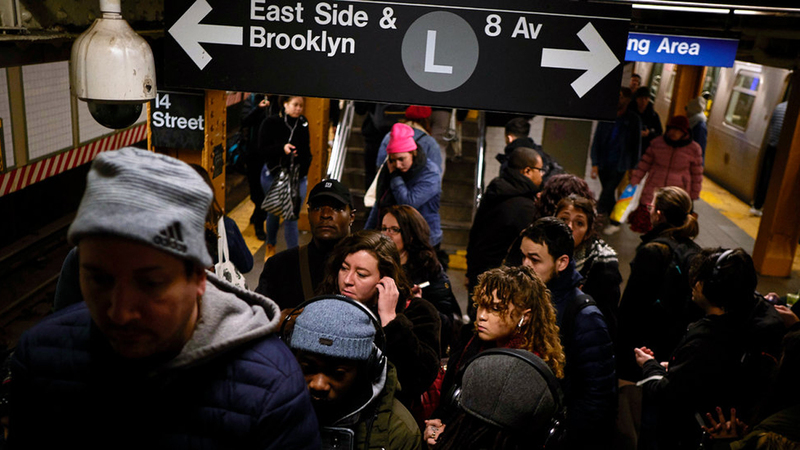 It has been called “L Hell,” the “L-pocalypse” and the “L-mageddon.” It was the impending 15-month shutdown of the busiest part of the Canarsie “L” line on New York City Transit’s giant subway system. For the uninitiated, the line runs under 14th Street in Manhattan, into Brooklyn, under Williamsburg and other neighborhoods that have recently become the “hot” places to be, before rumbling onto an elevated structure and out to Canarsie at the far end of the borough and ending on some of the system’s only surface-level right-of-way. The L was falling apart in the 1980s, but today it comes equipped with Communications-Based Train Control (CBTC), which allows for semi-automated operation and increased capacity (24 trains per hour, rather than the previous 20). It appears that the line now has enough riders to need that extra capacity. Between the boroughs and under the East River lie the Canarsie Tunnels, which were flooded in 2012 by Hurricane Sandy (as were many other railroad tunnels in the area) and have needed repair ever since. The New York Metropolitan Transportation Authority (MTA), which runs the transit system, set the fateful day for April 26, and the grim countdown had already begun. Some New Yorkers took it all in stride, because they take everything in stride. Others moved or changed jobs to avoid the dreaded time-consuming commute that they would soon be forced to endure, as if Orson Welles’ Martians were about to land nearby and destroy everything in sight. The plan had entailed running only the Brooklyn portion of the line, with added service on connecting lines like the “G” train (Brooklyn-Queens Local) and some others. The tunnels would be out of service, and 14th Street, a major commercial street a century ago and fighting to return to that status today, would be left without a crosstown train for the first time in almost 95 years. It would turn into a massive busway for the duration. Everybody knew that it would not be easy, even by New York City standards. Then came the astounding news on Jan. 3 that the shutdown itself would be shut down. Only one tunnel will be taken out of service at a time, so there will still be some trains running under 14th Street and into Brooklyn. The idea came from senior engineering faculty at Cornell and Columbia Universities. In its Jan. 4 edition, the Daily News sported a headline that read “L Yeah! 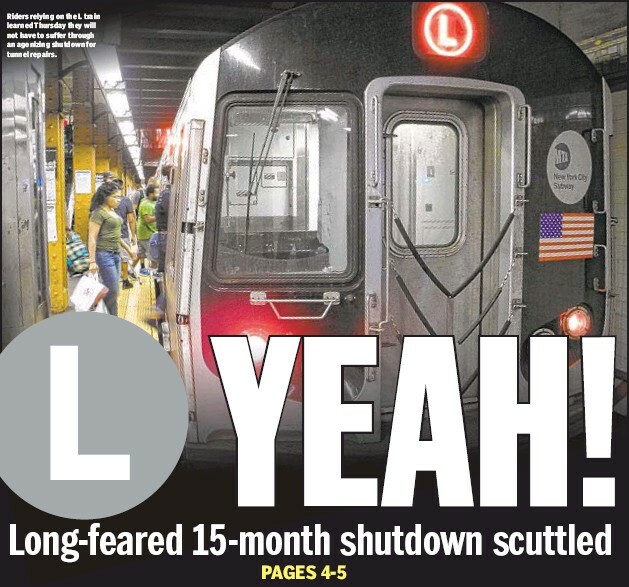 Long-Feared 15-Month Shutdown Scuttled,” with the “L” depicted as the line’s logo: the letter “L” in white on a gray circle. The City breathed a collective sigh of relief, and some New Yorkers combined it with another sigh of disbelief. Engineering Editor Paul Conley reported the story here in Railway Age on Jan. 3. The saga is far from over, but everybody is enjoying the spectacle, even though they do not know what will happen next. In theory, it may not be so bad, after all: Service will only be reduced, not eliminated, at night and on weekends. Not everybody actually believes that, but they are all counting on it. There is some truth to that characterization. 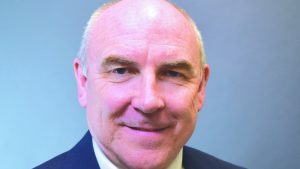 Popular and highly respected NYCT President Andy Byford appears on the defensive, everyone concerned has joined the fray, and anything can happen. It has been said that controversy will eventually reveal the truth. Time will tell. This drama is still being played out at this writing, but it is definitely a limited engagement. The work is coming in April, even though its scope will be less than originally expected. Why did Gov. Cuomo consult engineers from the faculties of Columbia and Cornell Universities? Why did those university-based engineers suggest a plan that appears, at least on the surface, to perform better than the original and at a significantly lower cost? What about the MTA Board and management: Will they be able to do anything about it, and should they? And why did Cuomo do it now, at the beginning of his ninth year in office? Tune in tomorrow for the next intriguing episode of L-TRAIN FACES LIFE! These questions are not merely academic, so to speak. The answers that emerge could re-define transit projects for the next generation or two. 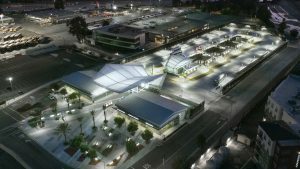 They could result in a re-evaluation of who should be given the task of estimating the scope and cost of future transit projects, and that could affect billions of dollars’ worth of spending on those projects. That could happen with highway projects, too, but any speculation about highways lies far beyond our purview. To this writer, whatever happens may be nothing short of revolutionary. 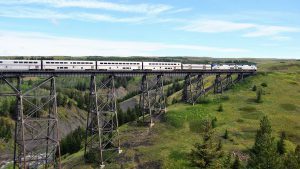 It could affect the number and scope of transit projects, especially new-starts, for the foreseeable future and beyond. It may also determine how much muscle well-established consulting firms have in making cost estimates on major projects. Cuomo fired the first shot over the bow. However well or poorly he emerges in this skirmish, the consulting community may not come out unscathed. Andrew Cuomo has been the governor for the past eight years. His father, Mario, held the same office from 1983 to 1994, and is still remembered fondly by many Democrats (and that includes most New Yorkers, at least since the election last November). Andrew has had a lackluster record, including on transit issues, but he blamed the Republicans who controlled the New York State Senate for thwarting his agenda. The Senate changed hands, and he swung into action. He consulted department heads and other senior faculty from the engineering schools at Cornell and Columbia Universities. They decided that the previously planned full shutdown would not be necessary. Some New Yorkers were relieved, while others were incredulous. Still others were upset to find that they had made their escape plans, which would now mean wasted effort and, even worse, wasted money. The original plan was to demolish and rebuild the bench walls along the entire length of both tunnels, with new cables inside those bench walls that would replace the original ones embedded in them today. The alternative is to leave the old bench walls alone where they are structurally sound, remove portions of them and replace those portions with only a walkway where they are not, seal them with new state-of-the-art material, and hang new cables on the tunnel walls. As soon as the proposed improvement was announced, the questions started. Can this really be done? How long would the work last? Do we run the risk of being exposed to silica dust? Why did the governor surprise us with that plan? Is he sincere, or is he grandstanding? Why did the big-time engineers miss this simpler and less-expensive approach? If this is feasible, why did they propose a total shutdown? The last two questions are the most perplexing. 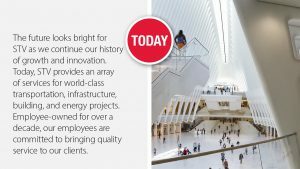 The firm heading the project is WSP USA, part of WSP Global and successor to Parsons Brinckerhoff (“PB”), one of the most prestigious and successful engineering firms in the world. Its founder, William Barclay Parsons, had supervised the construction of the original IRT subway in New York, which opened in 1904. There are other firms in the elite group, and they often form complex joint ventures for a specific project. As well, many high-ranking transit executives take positions at these firms when they retire from the transit agencies. As such, the influence wielded by large consulting firms is considerable. We do not yet know exactly what good will come from that, but we know that the engineers Cuomo consulted do not owe any loyalty or expectations to the established consulting firms, beyond the appropriate conduct that they owe fellow members of the engineering profession. They have academic tenure, which means lifetime job security—unlike transit executives, whose careers can rise or fall at the whim of a mayor or governor. Their engineering schools pre-date the New York subways. Cornell was founded in 1865 and its engineering school in 1870. Columbia started life as King’s College in 1754 and changed its name 30 later, after the King’s rule was ousted. Its engineering school goes back to 1864, and William Barclay Parsons himself graduated from there in 1879. Faculty members have institutional reputations to protect that are hundreds of years old. They also know who they are contradicting, so they know that they need to exercise professional caution. If a “battle of the experts” ensues, we will learn that soon enough. To this writer, at least, that scenario appears unlikely. There appears to be some inconsistency in the current and former engineering opinions coming from the same firm. A lot of people want to know why. We may know more answers soon. Beyond the current L-train project, there could be major implications for transit projects around the nation that could affect billions of dollars in spending and the amount of mobility that millions of current and future transit riders will have. There is another example that also touches and concerns New York City. The big long-term controversy in the Metropolitan area is about Gateway, a set of projects that includes two new Hudson Tunnels, among other things. The Interim Executive Director of the Gateway Program Development Corp., which is supervising the Gateway project, also works for WSP USA. He is John D. Porcari, and he has held positions as Transportation Secretary for Maryland and Deputy Secretary at the USDOT. 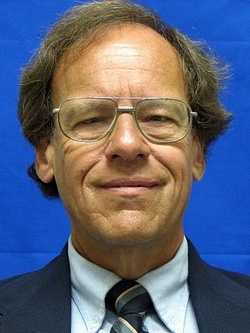 His biographical sketch on the firm’s web site, www.wsp.com, confirms that he holds both the Gateway position and that of President, Advisory Services, United States for WSP at present. Porcari and other Gateway people are calling for a total shutdown of the Hudson Tunnels (also known as the North River Tunnels) between New Jersey and Penn Station New York for overhaul after the two new tunnels are completed. Just how similar the Hudson Tunnel repairs would be to those required by the Canarsie Tunnels is uncertain, but we do know that they were also flooded in Hurricane Sandy, and that only a relatively small portion of the bench walls was damaged. To this writer, it seems reasonable to expect that the damage that Sandy caused to the Hudson Tunnels is similar in magnitude to the damage that Sandy caused to the Canarsie Tunnels. If that expectation is incorrect on technical grounds, we should know exactly how and why. Otherwise, there does not appear to be any valid reason why the methods that will now be employed to repair the Canarsie Tunnels could not also be used to repair the Hudson Tunnels. If that can be done, the project could be completely different. For years, one of the Hudson Tunnels has been taken out of service every weekend (except when both were kept open for the Super Bowl five years ago). In a best-case scenario, both tunnels could be repaired within the next few years, and it would not be necessary to build the new tunnels first. One new tunnel is essential (two would be ideal—if affordable), but the time pressure on building one or both could be relieved, as there would be time to build the additional tunnel capacity without undue urgency about the existing tunnels failing. Repairing the existing tunnels, rather than rebuilding them completely, would save a great deal of money, too. Some advocates do not see how there could be enough money available to build the entire Gateway set of projects as currently proposed, at an estimated total cost of $30 billion or more. Saving a few billion of those dollars makes the overall project more affordable, which also means more likely to be built. Maybe the most expensive way to build a project is the best way for that particular project, but it is foolish and wasteful to assume that it always is. It makes far more sense to have competition. Europe has strict EU-wide tendering rules for public construction contracts, a system that might help here (https://europa.eu/youreurope/business/selling-in-eu/public-contracts/rules-procedures/index_en.htm). The Massachusetts Bay Transportation Authority (MBTA) and the Massachusetts Department of Transportation (MassDOT) were treated to a moment of candor by consulting firm ASCENT in the Interim Project Management Team Report: Green Line Extension Project, submitted May 9, 2016. MassDOT and the MBTA Fiscal and Management Control Board had commissioned the report as part of an effort to reduce the cost of the planned Green Line light rail extension from Lechmere Square in Cambridge to Somerville and Medford. In the “Best Practices” section, the report concluded: “The MBTA staff was ill-equipped to deal with the complexity of managing the project, managing the design, and managing the consultants … Too much autonomy and authority was ceded to the consultants, who took full advantage by charging too much and delivering too little,” and, “An MBTA culture that valued process too much over outcomes stifled initiative and diffused accountability” (at 29). The report recommended a new program management approach: “The Program Management team must be equal to, or better than, the architects, engineers, contractors and consultants it employs. Above all, it must be accountable for outcomes.” (Id.). This sounds like good advice for all transit managers, but it is apparently seldom followed in practice. Spending “top dollar” on every project does not help public officials who could end up paying too much money for the projects they get. It does not help the taxpayers, who are not getting the most for their money. It certainly does not help the transit-riding public, because capital budgets for transit projects and the government grants that help with the payments are both limited. If one project is overpriced, that means another project will not be built, so riders would not have access to the amount of transit infrastructure that they could enjoy if their fares and tax money were spent with optimal efficiency and cost-effectiveness. Even if each project ultimately becomes less-expensive, there would be more projects, and the big firms would still have plenty of work. So would the construction workers who will build those additional projects. This writer has complained for years about meddling by New Jersey’s governors at NJ Transit, but Gov. Cuomo’s “meddling” in New York’s transit affairs appears to have provided a benefit for the riders already. The outcome of any action depends on the facts, and the facts are different on each side of the Hudson River. How much benefit New York’s riders receive in the long run remains to be seen, but it appears that everybody can win if his act of getting a “second opinion” catches on among transit heads and political officials who make decisions about our transit. I will keep watching the situation with the Canarsie Tunnels, and will have more to report about Gateway in the future. In the meantime, Andrew Cuomo may have started a “transit revolution” on the New York side. Time will tell if that happens, but it is a good start that he intervened in the first place. He opened the proverbial can of worms, and the more we know about what those worms look like, the better. So, the next time a doctor tells you that you need surgery, or worse, be sure to get a second opinion from another doctor. In an analogous situation, Gov. Cuomo did that, and it appears that New York City Transit customers will be better off because he did. David Peter Alan lives and practices law in South Orange, New Jersey. He has been an advocate for better transit for more than 34 years, and is involved on the national and local scenes.